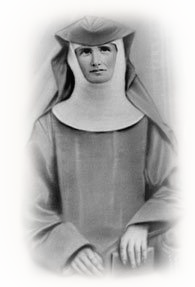 Mother Mary Anselma Felber was born on January 21, 1843, at Kottwil, Canton-Luzern in Switzerland and was baptized Elizabeth Felber. Her parents were righteous and God-fearing and taught her to love God above all. The grace of God led Elizabeth to give her life to the service of the Lord and of his holy Church. Therefore at only 16 years old, she entered the Convent of Perpetual Adoration at Maria Rickenbach. She was given the name Sister Mary Anselma. In this quickly flourishing house she would, after a year of probation, pronounce her vows on May 30, 1860. She so well adapted to the spirit of her new religious family that the confidence of the superiors and the love of her fellow-sisters soon made her assistant of the Reverend Mother. In this position she worked for the welfare and blessing of the convent until God’s providence wanted her in holy obedience to go to far-away America.